The same studio who steals days, weeks or years of people’s lives, in the form of World of Warcraft, set their sights on taking time away from players in this highly addictive collectible card game. No prior knowledge of Warcraft is required and the mechanics are simple enough for anyone to pick up and play. The game is free to play, to lure players in, and fans can constantly win games without spending any cash (though it can help). The tutorial provides players with the basics of the game but through multiple hours of play, fans will discover the complicated and deep nature of the combat. Players can purchase booster packs to augment their collection with in-game currency or through real-life currency. In-game gold is earned by defeating three players or completing daily challenges. 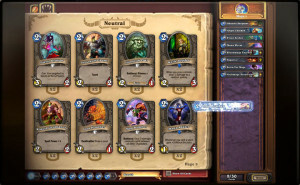 The constant stream of unlocked cards, in-game gold which turns into new packs and options to retool the player’s deck will have you playing ‘just one more game’ until a few hours disappear. What is a Critical Hit! There are nine distinct heroes available for players to choose from. Each hero has access to specialized cards that the other doesn’t and a unique ability to their class. The Heroes are balanced and abilities match their descriptions: the Priest specializes in healing, the Mage in casting spells, the Hunter on offensive strikes, and the Paladin on summoning an army. Players combine the specialized hero cards with standard basic monster cards to create a unique 30 piece deck. No hero is overly powerful compared to the others and each is effective depending on the situation. Each hero has 30 health and once it reaches zero, the game is over. At the start of the round players have one level of mana. Mana is required to utilize cards in the deck and a simple one attack monster could cost one mana, but a high level spell could cost seven. At the end of each round players gain an additional piece of maximum mana and a new card. Players cannot carry-over mana from rounds; for example if you can’t play anything on turn two, the next turn you will have three mana, not five. This balance and gradual increase in power on both sides creates an ebb and flow of the game. Some players can opt for a strategy which rushes in the beginning where others will hope to stall until they have ten mana and can summon the most devastating monsters. Monsters can come in with a variety of abilities. Upon being summoned to the field, each creature must rest for their first turn; unless they are equipped with the Charge ability. Some creatures will heal allies upon being summoned, deal direct damage or buff their ally’s stats. The cards are balanced, there is not a level two monster who is more powerful than a level three, but there are differences in abilities which can make one more beneficial to play in a given situation than the other. 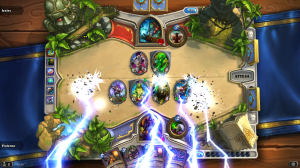 Hearthstone is continually providing players with new toys to play with, especially in the beginning. The constant stream of unlocking new heroes (by defeating them), buying new packs or completing a daily challenge provide a constantly shifting goal to chase. Outside of practice, where gold cannot be earned, players can complete in standard “play” or the arena. The Play section is broken into casual or ranked. Don’t be fooled though, the casual players are the same cutthroat effective people fought in ranked, just without the consequences of a lost status. The arena section, challenges players to select a hero and create a random deck to fight with. This deck has no bearing on the cards you unlocked, creating an opportunity to play with cards you haven’t unlocked. More wins in arena mode yield a greater prize (more cards to play with), but three losses end your run. This creates a sense of tension during each battle as you want the streak to continue. Gameplay on the iPad version is easy to pick up and the touch controls do exactly what you would expect them to, but there were a couple instances where they hindered more than helped. While activating a hero ability, when dragging to a target, it would take more than a couple swipes to recognize. Purchasing new cards is always a great feeling, but having to turn over the five on-screen cards feels more like a waste of time than a ‘mystery reveal.” Building the most powerful decks takes time, especially when trying to drag and drop from the screen to the side and can result in some mis-swipes. For as fun as Hearthstone is, losing to a ‘luck of the draw’ situation always feels bad. Each player can build their deck but there is still an element of randomness to the card available in your hand. There were instances when my deck contained 8 characters with the Taunt skill (which forces monsters to attack your creature instead of the hero) and I didn’t pull a single one. 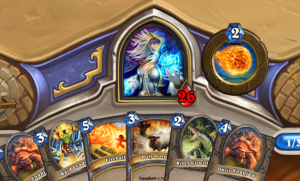 This allowed my opponent to steamroll through my health. There are other situations where it feels like you aren’t pulling any of the right cards, but your opponent is drawing everything in the perfect order to control the board constantly. The time limit is too long for players to make choices, especially in the first rounds. Each player has approximately 90 seconds to make their selection, which should only occur when there are a lot of variables to the situation. The game does redeem itself by only providing a player with ten seconds if they took the entire time in the previous round. 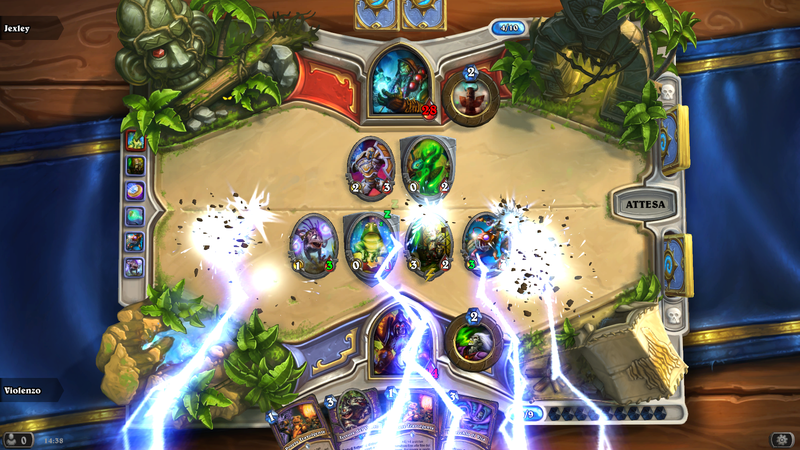 Hearthstone is an easy to pick-up game with great artwork, sound effects and addictive gameplay. iPad players are dropped seamlessly into the Battle.net world and can compete with people playing on their computers. The game sets matches up quickly and each battle lasts for 10 – 15 minutes, making it an easy choice to hit that “find opponent” just one more time. Players can easily lose themselves in the battles and constant quest to unlock additional cards. If you enjoy turn based role playing games, collectible card battles or figuring out the best tactic for the situation than this is an easy win. If you prefer your games to not have an element of luck or be AAA-blockbusters than this might be one to hold off on, but it’s still free so you aren’t losing anything by giving it a shot, except for time…oh so much time will disappear.